Rebuild thumbs, exif, and resized images in specific album. Rebuild single items as well. Gives the administrator the ability to rebuild items (thumbs and re-sizes) as well as EXIF data. It marks the items in the database as 'dirty' and Gallery will then attempt to fix those items that are marked as dirty. Download the module from: http://codex.galleryproject.org/images/e/ee/Rebuild_items.zip . Extract the module to the module directory of your G3 install. If you experience EXIF data, thumb or resize issues in a particular album, choose the 'rebuild items' action from the 'Album options' dropdown. Select what items you would like to be fixed. Only the first action on the list will be performed. 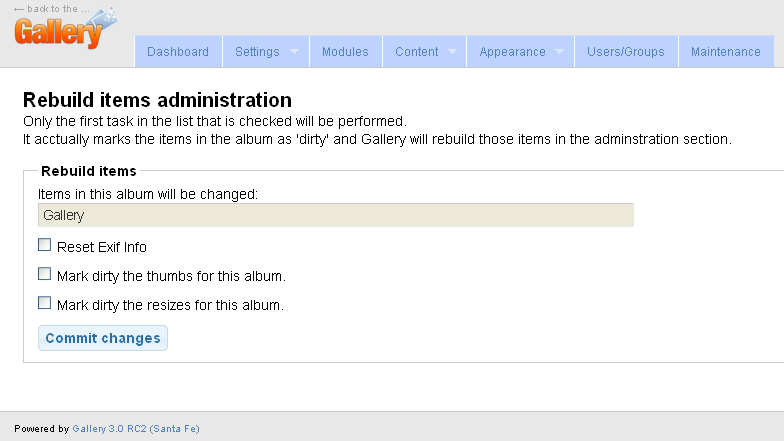 After you 'commit changes', you will now see a link to have Gallery fix/rebuild those items in the album you chose. Perform the action that Gallery requests you to do. Sub-albums are not chosen in this operation. You will need to perform the action on each album. This is done for performance and resource issues. This module is not designed for the manual replacement of the original item(s). Especially if the size or aspect ratio is changed. This page was last modified on 1 July 2013, at 15:26.